Flu—it hit me square in the spleen! Each person who succumbs to flu viruses succumbs in an individual way, because of the person’s physical and emotional lapses of protection. I didn’t succumb to flu because of physical weakness; I lowered my defenses because of emotional agitation. The blog post “Flu Season Do’s and Don’ts” teaches that the emotion, contentment, offers extra protection. Lately, contentment has been replaced by dissatisfaction and despair, so that my body could not protect me when a strong virus invaded. No amount of ginger tea or garlic would have helped me. When the flu virus took over in my body, it messed with many of the systems in my body, and especially my immune system. After the flu was battled and suppressed by my body’s healing capabilities, the flu left weakness in my spleen, and that is why I am fuzzy and weak, but not coughing or wracked by secondary sinusitis. Had the flu left its weakening in my lungs, the cough would continue after the flu virus had been suppressed. Had the flu left its weakening in my liver, my digestive functioning would have been sluggish. Had the flu left its weakening in my trigeminal nerve, sinusitis or changed taste perception could have occurred. Had the flu left its weakening in either my choroid plexus (in the brain) or my cerebral sinuses, my sense of balance and blood pressure regulation would have been compromised. Had the flu left its weakening in my pancreas, compromised metabolism would have been produced. Had the flu weakened my vagus nerve and gallbladder, protection from gallstones could be lessened. And had the flu weakened my heart, numerous systems in my body, individually or jointly, would be harmed. There are more resulting health effects from the flu, but the ones listed give an idea of the extent of diversity of flu havoc. The best way to heal from flu’s weakening effects is to strengthen emotional and physical weaknesses. Emotional and physical weaknesses are equally responsible for flu affliction. Their strengthening are equally responsible for flu healing. Note: These wise words are provided by Spirit. Seek medical care as needed. Flu Destruction: Yes, the Flu is Dangerous! The flu annoys and disturbs functioning. It sometimes leads to serious illness when the afflicted person has a compromised immune system or ignores the body’s messages to fight the flu virus. The flu charges the body with force that is hard to stop. Propelled towards openings, flu viruses enter the body with coded instructions to overcome the body’s defenses. To combat invasion by flu viruses, the body must respond with equal force. The viruses withstand basic defenses. They are overcome only when the body’s defenses are focused and protective. If the body is busy handling emotional upheaval, is dimmed from too little rest, is stressed from existing illness, or is experiencing anticipation or episodes of fear, flu viruses can prevail. The diminished state of the body cannot withstand the force of the flu viruses. When a virus enters the body, the defenses give way or rally depending on the state of health and the person’s willingness to care for his or her body. As the body notifies about the flu invasion, care through rest, wise nutrition, and desire to heal are the steps that rally the body’s defenses. Aids such as Vitamin C can help, but only if the other self-care steps are taken as well. Ignoring the body’s miserable state can lead to extended flu with long-lingering secondary effects. If the body is depleted when the flu virus charges, the intensity of the flu can seem worse than it is. Healing takes longer, but occurs when self-care is good. If the body is depleted and self-care is too little, the body can become very ill. Other germs can invade as well, and the body might require intensive care to heal. The flu is a serious illness that should be protected against by good nutrition, proper rest, and attention to stresses. If the flu succeeds in beating the body’s defenses, self-care is very important. Our bodies are built to withstand the onslaught of flu viruses, but we must assist them in their constant vigil against illness. Staying well is the best defense! Also read “Flu Season Do’s and Don’ts” and “Flu Protection: What to Eat”. Note: These wise words are provided by Spiritual Presence. Seek medical care as needed. The flu is a serious virus that should be protected against by good nutrition, proper rest, and attention to stresses. If the flu succeeds in beating the body’s defenses, self-care is very important. Our bodies are built to withstand the onslaught of flu viruses, but we must assist them in their constant vigil against illness. Staying well is the best defense! Note: These wise words are provided by Spiritual Presence. Flu season is approaching. Here are food tips to protect against the flu and to heal from the flu. Eat foods that increase resistance: pumpkin, arugula, cabbage, parsley, lemon, pomegranate, mulberries, buckwheat, blackstrap molasses, and kombu seaweed. Other vegetables that are helpful in strengthening the body besides these ten foods are: cruciferous vegetables (which include the cabbage and arugula listed above) and orange-colored vegetables (which include the pumpkin listed above). Eat a reasonable amount of food each day. Too much food taxes the body’s defenses. Too little food lowers the body’s resistance. Supplement your diet with garlic, sprouted seeds from the cabbage family (broccoli, watercress, and turnip sprouts), and small amounts of certain oils (olive oil that was cold-pressed extra virgin, evening primrose oil, and borage seed oil). Warming foods are helpful. If chewing is an effort, eat pureed vegetable and chicken soup, if you eat meat. Eat pureed vegetable and legume soup, if you don’t eat meat. Eat when your appetite appears. Don’t put off eating, because the flu can influence your desire to take in foods that combat the virus. Eat foods listed in the section above. Slowly increase the amount of food you eat. Avoid highly processed and sweetened foods. Limit the amount of dairy products until the residual effects of the flu have passed. Also read “Flu Season Do’s and Don’ts” and “Flu Destruction—Yes, the Flu is Dangerous” . Flu can strike at any time, but the winter is especially rife with flu viruses. The viruses hitchhike from carrier to carrier, surprising the body’s defenses with distinct vitality. In order to combat flu vitality, here are do’s and don’ts that can protect you from contracting the flu. Stay hydrated throughout the day. 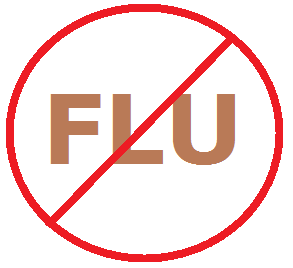 The body can flush out flu viruses when fluids are flowing optimally. Water is the best hydrator, followed by barley tea and parsley juice/tea. Breathe protectively Shallow breathing cannot supply oxygen like deep breathing. The more rhythmic and deep the breathing throughout the day, the more the body can withstand flu vitality. Wear clothing that protects. Don’t wear clothes for warm weather in the winter. Don’t overdress in overheated spaces. Don’t over-shiver (shivering is a normal reaction to cold, but over-shivering means the shivering has gone on for too long or the intensity of the cold is too much for your body). Stay active. Keep exercising and moving throughout the winter months. Sleep the proper amount for your body. The body requires enough sleep to fortify against invading germs. A weary body struggles against powerful flu viruses. Don’t skip any of the tips in the Do’s list! An optimistic attitude offers extra protection. The emotion, contentment, offers extra protection.